Posted on June 12, 2017 at 11:58 am. Yasodhara Ashram’s 22nd annual Strawberry Social on Saturday, June 24 from 1- 4 pm is a delicious opportunity to indulge in fresh Creston strawberries and cream, and to gather with friends and associates. 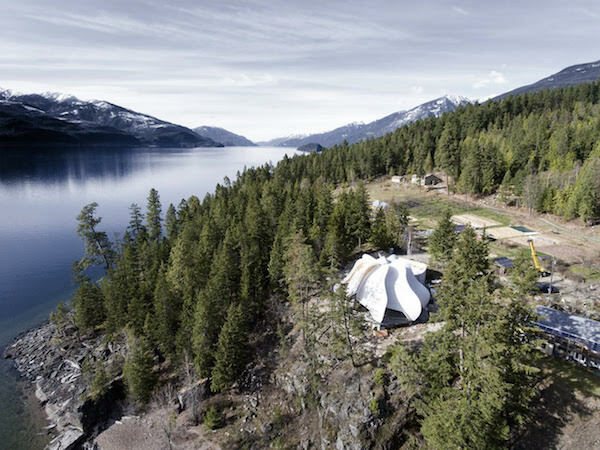 Yasodhara – Canada’s first ashram – is also building an extraordinary new Temple of Light, with construction completion and an official opening scheduled for August 5. While you are at the Ashram, explore the grounds and extensive gardens. Shop at the annual used book sale, with proceeds donated to the Crawford Bay School’s hot lunch program. Special activities are planned for children, too! Yasodhara Ashram is located at 527 Walkers Landing Road, five minutes from the Kootenay Bay ferry landing. Thanks to the support of Columbia Basin Trust. Yasodhara Ashram is a yoga retreat and study centre founded in 1963 by Swami Radha. 54 years later, the Ashram remains a vibrant community welcoming people of all ages and backgrounds to discover the transformative power of yoga. The new Temple of Light replaces the original, which was destroyed by fire three years ago. Operated largely by volunteers and local employees, Yasodhara Ashram is a Canadian charity with a year-round population ranging from 50 – 100 people. Committed to environmental initiatives, the Ashram has an international reputation for excellence in teaching and adapting to change. Please contact Terry Taylor-Topp at 250-227-9224 or media@yasodhara.org.